A decade is not even a drop in the ocean of history and heritage; cultures and communities; sights and sounds that make up our state. Change is inevitable in an increasingly connected world. Our Rajasthan, too has been undergoing a metamorphosis. The ghunghat is being replaced. Manju Devi, a porter in Jaipur station has broken into a very male bastion. So has Meera Bai Meena who repairs handpumps in hamlets nestled in the hills of Udaipur. The travails and triumphs of Rupa Yadav, a child bride who is now pursuing her MBBS, exemplifies the change in mindsets. I see a difference in every sector. It was the women of the state who campaigned to make the state free of open defecation. Village Wildlife Watchers, unread in most part and volunteers at that, use Whatsapp to monitor wild animals in their charge. Today, Rajasthan has institutions of National repute IIT, IIM, AIIMS, National Law School. Youth from Rajasthan are acquiring skills that make them employable. Just running after a degree has become a thing of the past. Enterprise has always been a part of Rajasthan’s DNA. An average Rajasthani is industrious and ready to take risks. Now, add to this the incredible energy of youth who are carving out their own future through startups that deal with smart solutions for every day problems delivering medicines to aged at home, aggregating autorickshaws, learning spoken English; the list is endless. Our youth and our small businesses are taking advantage of a reformed policy framework that allows them to breathe life into their creations. If you thought about buying a car lately, you probably checked out cardekho.com – that’s the changing face of Rajasthan for you, where an entirely home-grown startup has now become India’s largest. Frontier Markets is working with rural women in the sector of solar energy. MyLy is working on improving learning outcome of students, Ecomitra in the field of renewable energy; I could go on and on. In the last 10 years, the smartphone has shown the user what change can be. Smart infrastructure has now become an expectation. Rajasthan is proud to have one of the largest road networks in India. And, then there are the 90,000 kms of digital highway. Rajasthan has one of the most advanced digital infrastructures in the country and also front offices that leverage this digital strength to deliver to people safety and security through Abhay Command and Control Centers. Our digital infrastructure allows us to operate India’s largest DBT program Bhamashah. Nearly 42 crore transactions, worth more than Rs. 19,000 crore, cash and non cash have taken place on Bhamashah. 25% of India’s Common Service Centres we call them e-mitras are in Rajasthan delivering 400+ services. 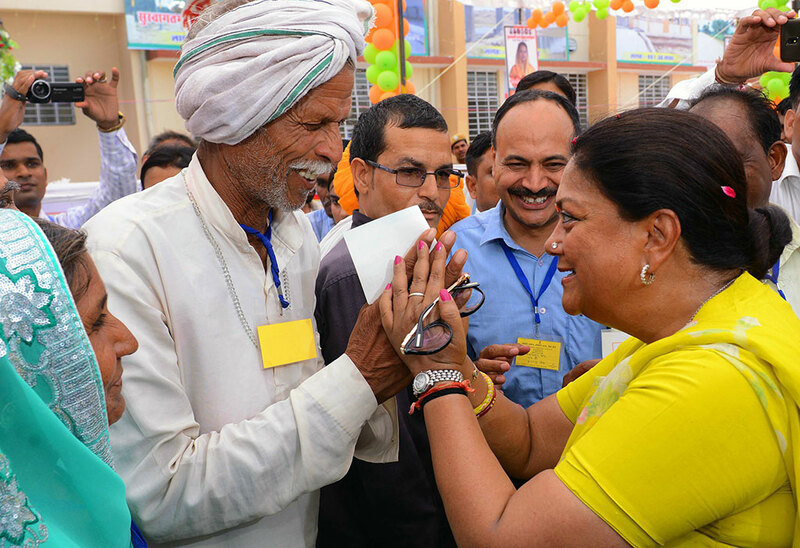 Digital is now the recognized strength of Rajasthan. Quality elementary education is germane to building foundations of the future. As recently as in 2012, Rajasthan had 28,000 elementary schools with less than 30 students. Nearly 9,000 had less than 15 students. More often than not, a child had to change schools thrice between classes I and XII. Today, government schools in Rajasthan have shown remarkable improvement in enrollment ratios, transition rates, gender gap reduction and in retention rate. The Board results speak for themselves and this year, class XII result show 90.53% for Arts, 86.6% for Science and 91.94% for Commerce in many ways better than private schools. It is no wonder that a reverse migration is taking place – parents are bringing back their kids to government schools. Such change makes us proud and serves as an encouragement. Not so long ago, hospitalization of a family member condemned a poor family to abject penury. Today, under Bhamashah Swasthya Beema Yojana, over 1 crore poor families have health insurance cover of upto Rs. 30,000. In case of selected life threatening diseases, this can even go upto Rs. 3 lakhs. Already, 21.50 lakh people have availed this facility. Insurance payout has been to the tune of Rs. 1100 crores. 700 private and more than 500 government hospitals are working together to achieve results and the poorest of the poor are now availing of hospitals they could not have thought of before. Maternal Mortality Rate, which was 318 in 2009, has reduced to 199 in 2016. Similar improvements are visible in IMR, Birth Rate and Death Rate. Some of our readers must have come across the Anapoorna Rasoi Vans. Immensely popular, these Vans serve hot, clean and nourishing meal at low prices, in all our urban local bodies. Our farmers are always at the mercy of nature. For the first time, farm loans to the tune of Rs 8400 crores has been waived by the State. This money is available to small and marginal farmers while others too are eligible to a proportionate waiver. But while waiving loans we are also strengthening our co-operative sector and disbursing fresh loans, equal to the amount waived. Dusty displays in dark corners with little interpretation is what our museums used to be. In a state like Rajasthan, where every mile has a story to tell, the collections of government museums are varied and priceless. Visitors deserve to see and appreciate them. To experience the change, step into Albert Hall or government museums in Bharatpur, Bikaner and Jodhpur and see for yourself. 18 State Museums are being reinvented, even the ones in the smaller towns such as Sikar, Jhalawar, Pali, Viratnagar, Alwar and Jaisalmer. Hopefully, they shall in time, become hubs for culture. While on the topic of change, there is a need as well as space for the new. So, when there are long queues before the Madhvendra Palace in Nahargarh, one realizes the importance of art in public spaces. Putting art in public spaces is an important step in demystifying art and exposing the younger generation to the finer aspects of life. And to continue the story, the Museum of Legacies in Kishanpol Bazaar in Jaipur and the soon to be opened Chowks and Kunds, buried under the roads of the walled city are an integral part of offering something new. In the space of monuments and legacies, we do have a problem of plenty. This is why partnerships are important. The days of passive management are over, the time is ripe to make our monuments, ‘living monuments’. Quality of life is an important indicator of happiness. Be it mobile libraries, toy banks or sanitary napkin dispensers, small inputs go a long way in boosting the happiness quotient. Change is when a fossil river, commonly called a nullah is rehabilitated with the expectation that it shall once again flow as a river should. The Dravyawati River Project should transform the Jaipur City scape and give residents the much needed promenades, gardens and open spaces. A Ring Road for the city is happening. As our cities grow, there is an urgent need to decongest traffic and offer much better connectivity. Every year, some part of the state faces a silent calamity – drought. We are as big as Germany with as many people as France. Yet, we have only 1% of India’s water resources. The imagery of a woman balancing numerous pots on her head and carrying water back home has for ages, typified Rajasthan. This has changed. Through Jal Swavlamban Abhiyan MJSA, we are carrying out one of India’s largest climate proofing exercises. More than 3.5 lakh water harvesting structures in over 12,000 villages have either been created or rehabilitated. Water table has risen, dried up hand-pumps and wells have started to flow. But there is a challenge to supply potable water to all inhabitants, as one has to live with the constant threat of fluoride and salinity. The Louvre in Paris sees more tourists in a year than India. Angkor Wat gets more visitors than Rajasthan does. We do not lack in sights, sounds and attractions but till 2015 we never ever had a planned tourism promotion campaign. We know the multiplier effect tourism has on economy. In the backdrop, we modestly planned to increase tourist footfalls in the state to 50 million by 2029. We will achieve this, this year itself and ‘jaane kya dikh jaye’ is a runaway hit. Amber today has the second highest footfalls of any monument in India, second only to Taj Mahal. A girl student grooming herself in front of a mirror in her school; the farmer using polytubes to grow vegetables; the long queues to the zoological parks in Sajjangarh, Machia and Nahargarh, and the energy of the youth at Masala Chowk will allow you to experience the change that is taking place in Rajasthan today. The credit goes to Team Rajasthan.